Denny Miller, who played Big Ed Barton in the third season Knight Rider episode The Rotten Apples, has died. He was 80. Perhaps best known for the classic TV Western Wagon Train (he played scout Duke Shannon in more than 100 episodes across three seasons), Miller was also the first blond Tarzan on the big screen (in 1959’s Tarzan, The Ape Man). He was recommended for the role by fellow Knight Rider bad guy William Smith (who played Harold T. Turner in the first season episode Short Notice). Miller was a strapping 6-foot 4-inches, and in the 1950s he played basketball at UCLA for the legendary coach John Wooden. In his senior year, while he was working as a furniture mover to pay for school, Miller was discovered on Sunset Boulevard by a Hollywood agent who signed him with Metro-Goldwyn-Mayer. His screen test was directed by legendary director George Cukor. Hundreds of guest spots on television followed over a career spanning 30 years, with Miller appearing in episodes of Gilligan’s Island, Have Gun — Will Travel, The Rifleman, Ben Casey, The Fugitive, I Spy, The High Chaparral, Hawaii Five-O, The Streets of San Francisco, I Dream of Jeannie, Gunsmoke, Mission: Impossible, The Rockford Files, Hardcastle and McCormick, Barnaby Jones, Charlie’s Angels, Dallas, and Dr. Quinn, Medicine Woman. He also guested on a number of other Glen Larson shows, including Quincy, M.E., Battlestar Galactica, Buck Rogers in the 25th Century, Magnum, P.I., McCloud, and The Fall Guy. 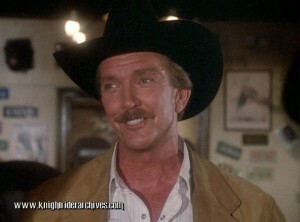 In his Knight Rider segment, Miller was the ringleader of a gang of modern-day cattle rustlers who were trying to force a young woman off her ranch. His character drove the menacing monster truck Bearfoot. In addition to his film and television credits, Miller also wrote two books: an autobiography entitled Didn’t You Used To Be… What’s His Name?, and a book about obesity in the United States titled Toxic Waist?…Get To Know Sweat! In January he was diagnosed with Lou Gehrig’s disease and passed away in Las Vegas on Tuesday, September 9. This entry was posted in Actors, Guest Stars, Knight Rider, Obituary, Original Series and tagged Denny Miller, Glen A. Larson, The Rotten Apples, William Smith. Bookmark the permalink.